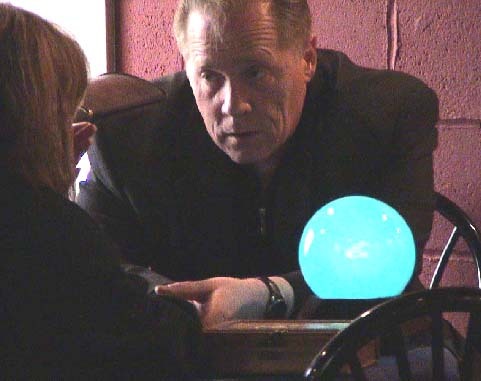 These are just a few things for the skeptics to think of when they are condemning an orb photo as a fake or fraud and some things for Paranormal investigators to consider when checking their Ghost photos for paranormal positives. Some paranormal investigators follow the idea that in the Northern climates or colder parts of the year, that ghosts tend to find it easier to take on shapes other than orbs. That's when there is the most static electrical charge is in the atmosphere. Those months being September through March. Ghost orbs might simply be Nature spirits or airborne protoplasm as you would find under a microscope, except far more advanced. Other types of ghostly phenomenon are the vortex (funnel shaped appearance) and Ectoplasm (it has a mist or smoky, foggy like appearance) also called Ecto Mist, or Ecto Orb Mist. No one has the true answer to this Orb question as of yet. One of the leading theories concerning what orbs are and the one that many believe the most is that they are not the spirit at all. The orb is the energy being transferred from a source (i.e. electricity, heat rising from an object, decaying energy, etc) to the spirit or ghost so they can manifest. Others maintain it is a natural occurrence of the Earth, (Earth Lights). This may not even be a conscious act the ghost is doing, just a natural way ghost get their energy or feed. This would explain why the orbs are round balls. According to the laws of Physics energy being transferring like that would assume is natural shape of a sphere. This theory can also be tied into the EMF readings that occur during actual haunted paranormal activity or manifestations. "Earth lights" may be related to ball lightning and earthquake lights but do not require electrical storm or earthquake conditions in order to appear. They usually haunt localized regions and are terrain-related. In some places many have been seen for generations. These places have so far been found to contain recurring geological characteristics such as significant faulting, seismic history, mineral deposits or bodies of water. This apparent geological connection is further highlighted by old mining texts which tell of the use of light balls emerging from the ground in prospecting for mineral seams, especially copper veins. This method of prospecting was used in England until early this century. Prime amongst current theories accounting for the lights is the Tectonic Stress Theory which posits that a strain field is produced during tectonic flexing of the Earth's crust in suitable zones, not necessarily leading to earthquake or tremor, and that this generalized field can move through an area, causing electrical and geomagnetic changes and focusing in certain topographical and geological configurations, producing light phenomena. Ethnology reveals that earth lights have been seen and absorbed into their magical world view by many ancient cultures and are/were usually interpreted as various kinds of spirits or shamans flying at night. Light phenomena have been associated with many "holy" mountains and hills world-wide, and temples have even been built dedicated to the lights in India, China and the Alps. It may be that prehistoric standing stones in western Europe were likewise raised in honor of places haunted by light phenomena. There have been many interpretations of the lights in Western society over the centuries. The longest-lived was that they were the fiery breath of dragons: the matter was the subject of scholarly debate during the Middle Ages. In Denmark and Germany, particularly strange lights were known as "treasure lights", hovering over buried treasure. In recent times they have been seen as enemy airships, and in World War Two, "foo fighters". Now they have been caught up in the UFO interpretation, though in some areas they are sometimes seen as ghosts or "spook lights". Typically the lights appear as "basketball-sized" globes, but smaller and larger ones have also been reliably reported. Also, the lights can take on many shapes and can hover, fly rapidly, perform acrobatic maneuvers, merge together, etc. The lights have been photographed, by individual witnesses and by research teams. The nature of the light energy is not known, but it seems to have electromagnetic aspects. There are, however, more exotic reported characteristics of these phenomena: their ability to assume coherent shapes, as well as to shape-shift, is not understood (as is indeed the case with ball lightning): the lights can sometimes be seen from one direction, but not from another; they can sometimes exhibit rapidly alternating signs of having mass and being weightless; they can sometimes burn vegetation and witnesses yet at other times have no effect. They may represent some kind of "macro-quantum" effect occurring in nature. Ball lighting is still baffling, scientists admit in a new report. They think the wisdom of more than 10 fields of science will be needed to explain the bizarre effect. Glowing spheres of ball lightning float above the ground for up to a minute, usually when thunderstorms are nearby. Eyewitness reports have often been dismissed as fantasy, but with around 10,000 sightings over the past few decades, scientists are now convinced that it really exists. A new report from the UK's Royal Society gathers many previously unpublished sightings of ball lightning. One describes how a luminous ball left a hole the size of a basketball in a screen door as it entered a house in Oregon, then navigated down to the basement and wrecked an old mangle. In another, an 80-centimetre glowing blob bounced on a Russian teacher's head more than 20 times before vanishing. But explaining the reports is extremely tricky. Ball lightning can shine as brightly as a 100-watt light bulb, but has no obvious power supply. It does not radiate heat, yet it can melt glass when it floats into windows. A leading theory suggests that ball lightning forms when a lightning strike vaporizes silica in soil. The silicon vapor condenses into a fine dust that is bound together by electrical charges into a floating ball, which would oxidize and glow (New Scientist magazine, 8 April 2000). "I am confident at this stage that the answer lies in the general direction of chemical reactions with very finely distributed particles," says John Abrahamson, a chemical engineer at the University of Canterbury in Christchurch, New Zealand. Another possibility is that air ionized by lightning could bind with water to create a hot ball of plasma with a cool water-and-ion coat. Orbs can be produced, and can appear quite readily on film by the elements and normal atmospheric conditions. Most orb photographs are merely the result of dust or even weather conditions such as rain and humidity. Moisture, dust and airborne particles up close to the lens at the time of the flash can and will effect the results of your pictures. Always make a note of the conditions around you when doing your investigation of ghost photography. But we all should be open to suggestions since dust and water don't explain all our haunted orb photos and paranormal observations. Or do they?